Welcome back to the Firebase Series, and congratulations on making it through a very code-heavy Part 3! I apologize if the last part seemed to drag on but securing our applications is arguably our most important job as developers. If you’re going to build anything, you might as well build it correctly the first time, right? In its current state, our application has two fully functional CRUD screens which took exactly 0 lines of code to secure (other than rules). Today, we will be taking a small break from coding and focus on getting our app hosted and serving via HTTPS FOR FREE! That’s right, zero cost, no credit card required HTTPS hosting for your application! In Part 3, we set up our NoSQL data model with Firestore and added security rules to secure our users’ data. We have an almost completely functional review app ready for beta users or analysts to start testing. Right now though, we do not have a way for them to get to it. Firebase makes this very easy. If you are just joining us, go ahead and clone this repository from GitHub and checkout the cloud-functions branch. You will have to follow Part 1 to get your environment set up and connect to Firebase using your credentials, but the code will be at the same place where we left off in Part 3. If you have already completed the previous parts, there is no need to checkout any other branch. Next run: firebase init – this command will launch an interactive terminal session where you will set up the project structure needed to deploy your app and Cloud Functions to Firebase. Answer “Yes” (Y) when prompted then proceed. Then, you will be asked which features you want to set up. Using the arrow keys and spacebar, select “Firestore”, “Functions”, and “Hosting and Storage” then hit enter. Next comes the Project Setup section. You will be asked what firebase project you would like to use as the default for the directory you are in. Select the one that you created for this tutorial. For Firestore rules, we will name the file firestore.rules. This is the default option, so you can just hit enter without typing anything. Then type “N” when asked if you want to overwrite the existing firestore.rules. Repeat this process when prompted for Firestore indexes (the file should be named firestore.indexes.json by default). When asked to run npm install, answer “Y”. This will be needed as Cloud Functions are run in a Node environment and require some dependencies to work properly, including the Firebase Functions and Admin SDKs. We have included a couple other dependencies that will be needed for Parts 5 and 6. For Hosting Setup, we will use dist as our public directory. This is where the angular CLI will build our application. Since this is a single-page app, answer “Y” when prompted thusly. Lastly, use the default option for the Storage Rules file (storage.rules) by hitting enter when prompted. If you mess up your setup, have no fear! You can run firebase init again at any time and make whatever changes you need by following the prompts. 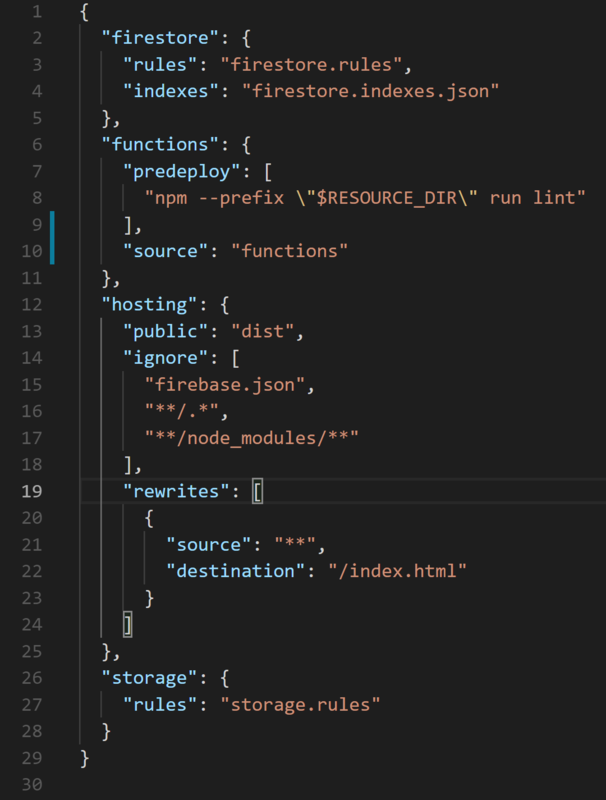 The last thing we will want to do is copy our Firestore Rules from the project console (Database > Rules) into our firestore.rules file and add the composite index we created earlier into firestore.indexes.json. If this step is not completed, deploying will overwrite the remote versions with the empty local files. Next run ng build to build your project to the dist directory. 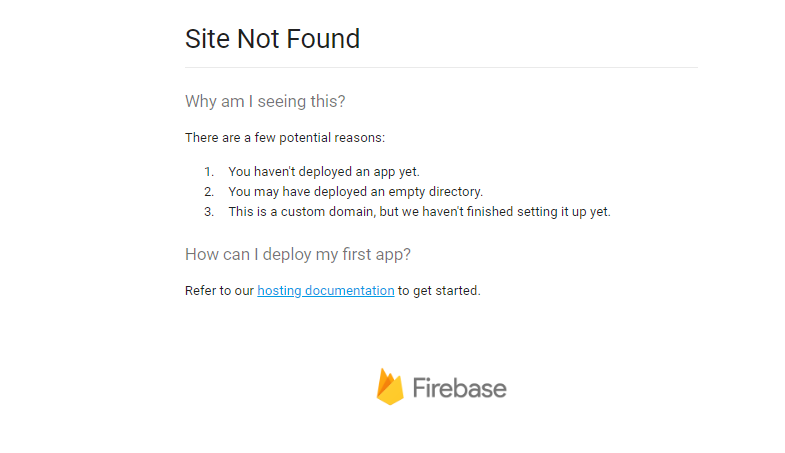 Then run firebase deploy—only hosting. The CLI tools will use the structure we just set up to push the contents of your dist directory out on a Google cloud static hosting server. You will get this (along with a public facing firebaseapp.com domain) free of charge, and the best part is that they automatically create and assign an SSL cert for you, again completely free of charge. When the deploy is complete, a Hosting URL will be given to you that will looking something like this. If you follow that URL, you should see your app! If you get a Site Not Found message, it is most likely because your dist folder was empty, or that you did not set up hosting to deploy your dist folder. Please make sure that your development server is not running while you are deploying as this moves the resources from the dist folder. And also, double check that your firebase.json hosting.public key points to dist. You now have a public facing application leveraging https and Google Cloud’s extensive CDN completely for free! In Part 5 I will walk you through Cloud Functions. Cloud functions, which can be triggered by various actions and events in our app, are extremely powerful. 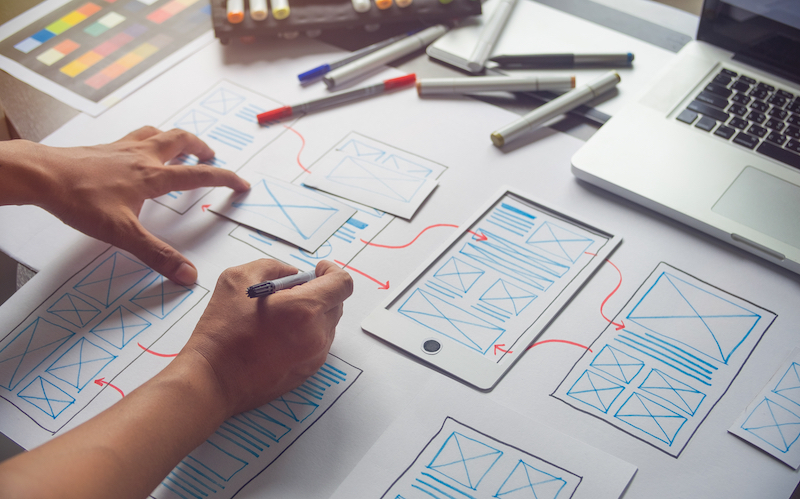 They allow us to handle asynchronous behind the scenes work without slowing down the application’s performance since they automatically scale based on application load. Sounds pretty cool right?